In addition to offering the solid aluminum Tin Man AR15 handle frames for the Do It Yourself speargun builder, we are also offering the Universal Trigger and Push Rod Assembly for mid handle spearguns. 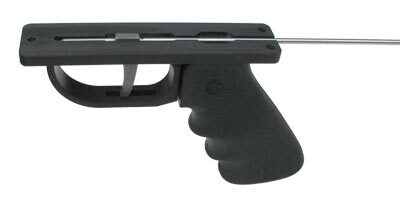 The 1/4" thick trigger and 3/16" diameter push rod are both made of 316 stainless steel. The trigger is positioned 10.5" from the rear end of the pushrod, to accommodate mid-handle spearguns with the handle placed well forward. Just cut it as short as required to suit your needs. The front of the push rod can also be trimmed shorter if desired, to position the trigger further forward in the frame if desired for your perfect trigger placement. When used in combination with the AR-15 handle frame, the trigger & push rod are contained by the frame so that the only required wood cuts are the pushrod slot to the mechanism, and a shallow relief to provide clearance for the top of the trigger to slide. All the precision fits are built into the handle, making installation a snap for the home builder. Bought the remote triggers for some mid handle guns. With the tin man handles they work great and are easy to install. High quality, good finish and solid construction. Mates perfectly with the handle frames and the slide feeling is smooth with hardly any side to side trigger slop 1mm max. Do wish the push rod length could be a bit longer (offer an option??) for slightly more fwd offset of the handle relative to trigger mech. Awesome fit to the AR handle base.